What & Where Is Kitsap Peninsula? Washington's Kitsap Peninsula lies between the Olympic Peninsula and Puget Sound. It is separated from the land mass of the Olympic Peninsula by Hood Canal. Hood Canal is not actually a man-made waterway, it is a natural fjord of the Puget Sound. Kitsap Peninsula's irregular shape creates almost 300 miles offshore. All this water, combined with lush green forests, makes the Peninsula a great places for gardens, parks, and outdoor recreation. Bremerton - Home to the Puget Sound Naval Shipyard and a Naval Station, Bremerton is the largest city on Kitsap Peninsula. Visitors will enjoy the city's military attractions as well as its many parks, shops, and galleries. Port Orchard - Located across Sinclair Inlet from Bremerton, Port Orchard welcomes visitors to its large marina and attractive waterfront. Poulsbo - This small town's Norwegian heritage is most evident in its charming historic downtown district. Poulsbo's downtown shops, restaurants, and galleries, along with the charming waterfront park and marina, make this small town a fun and popular place to visit. Silverdale - Located on the west side of Kitsap Peninsula, Silverdale is a retail hub with many big box and chain stores. The cities and towns on the Kitsap Peninsula can be reached by road or by the Washington State Ferry. State Highway 16, via the Tacoma Narrows Bridge, is the main route onto the peninsula. Ferry terminals are located at Bremerton, Bainbridge Island, Kingston, and Southworth. If you're looking for an expert guide, Kitsap Tours offer scheduled and private tours of Kitsap Peninsula and Bainbridge Island. 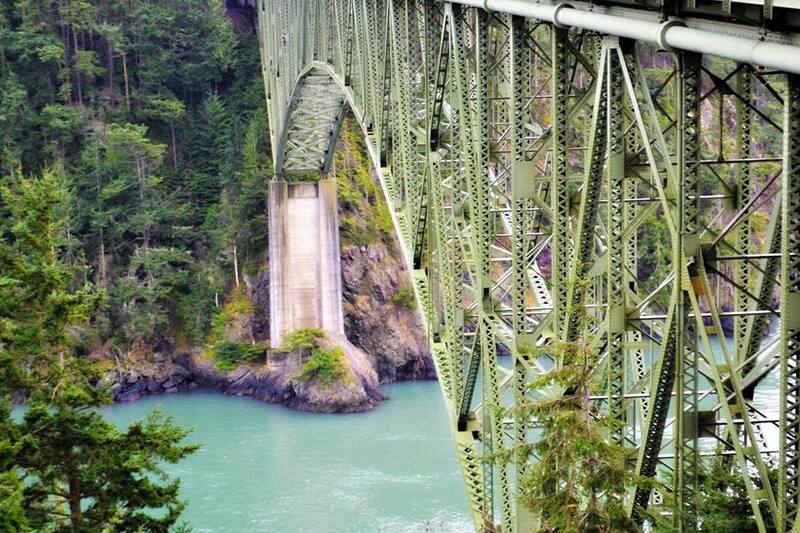 Bainbridge Island, part of Kitsap County, is another fun destination and is often part of a Kitsap Peninsula getaway. The Kitsap Peninsula's forested parks and preserves are great for hiking and biking. The miles and miles of shoreline provide fun for beachcombers and paddlers. Boaters and divers can enjoy exploring the waters surrounding the Peninsula. There are several state parks, most on or near the water, that offer camping as well as day use areas for picnicking and play. Kitsap Peninsula Water Trails - Launches, services, and amenities available to new and experienced paddlers. Olympic Outdoor Center - Lessons, gear rental, and guided tours are all available from Olympic Outdoor Center, with shops in both Poulsbo and Port Gamble. Banner Forest Heritage Park - This large park encompasses both forests and wetlands. Within Banner Forest Heritage Park you'll find miles of improved and unimproved trails suitable for walking or biking. Clear Creek Trail - Winding through and between the natural areas of Silverdale, this 5-mile trail system features interpretive panels highlighting local human and natural history. The Hansville Greenway - This network of trails passes through a set of natural areas set aside to serve as a corridor for wildlife to move around Kitsap Peninsula. One popular hike is the Sid Knutson Puget Sound to Hood Canal Trail, which runs from Norwegian Point Park south and then west to Hood Canal, passing a variety of ecosystems along the way. Check out the Hansville Greenway website to learn about all of the available trails, suggested hikes, and the flora and fauna you'll see along the way. Port Gamble, a turn-of-the-century company town, is now preserved as a National Historic Landmark. With its charming New England-style buildings and lovely waterfront setting, Port Gamble is a fun place to wander and explore. Be sure to visit the Port Gamble General Store & Cafe, which houses the local history museum as well as an astonishing collection of seashells. Port Gamble is located just east of the Hood Canal bridge. The US Navy has been a presence on the Kitsap Peninsula since 1892. It is the current home of Naval Base Kitsap, which includes the Naval Station in Bremerton and the Naval Submarine Base in Bangor. Naval Undersea Museum (Keyport) - This fascinating museum focuses on the history of undersea exploration and warfare. Exhibits and artifacts cover the ocean environment, torpedoes, submarines, and diving. Outdoor exhibits include deep-sea vehicles. The museum's exhibits will be of interest to anyone interested in naval history, oceanography, or technology. Puget Sound Navy Museum (Bremerton) - Located between the Puget Sound Naval Shipyard and the Bremerton Ferry Dock, this extensive facility is the place to learn about the naval history of the Pacific Northwest. A portion of the museum occupies the historic Building 50, originally built in 1896, while another section of the museum is of more modern architecture. The Puget Sound Navy Museum's permanent exhibits include artifacts from the USS John C. Stennis nuclear-powered aircraft carrier and related to special-operations submarines. Admission is free. USS Turner Joy (Bremerton) - This Vietnam-era Naval Destroyer now serves as a museum and memorial honoring Naval personnel. Ladder climbing is required while touring some portions of the ship. The USS Turner Joy is also available for special events and overnight stays. Suquamish Museum & Cultural Center (Suquamish) - This excellent museum focuses on the history and culture of the Puget Sound Salish Tribes, particularly the local Suquamish Tribe. The lovely new facility will house exhibit galleries, a gift shop, performance and educational spaces, a botanical garden, and workspace for wood carving and craft making. Chief Seattle Grave Site (Suquamish) - People familiar with Chief Seattle's contributions to Pacific Northwest history and his famous speech may wish to pay their respects at the Suquamish Memorial Cemetery, located adjacent to St. Peter's Catholic Church of NE South Street. The peninsula's major waterfront communities each offer local shops and galleries, typically near the marina or ferry dock. In Poulsbo, you'll find Scandinavian-themed shops and bakeries, a great bookstore, and galleries featuring the work of local artists. Many of the charming and well-preserved homes and buildings in Port Gamble are now occupied by retail shops.